Each year in December the Albuquerque Convention & Visitors Bureau offers travel agents a FAM weekend in beautiful Albuquerque/Santa Fe with true Southwest hospitality. I was fortunate enough to be able to attend in December 2003. Upon arrival the vivacious Shamaine Giannini from the Convention and Visitors Bureau, greeted me at the airport. As my plane had been cancelled in Baltimore and I had to make other arrangements, I was later than expected and had missed the shuttle bus. Shamaine drove me to the Marriott Residence Inn in her personal car. Checked in at the Marriott Residence Inn and was pleasantly surprised to find I had an attractively furnished single efficiency apartment as my home for the next four days. Barbara Gabaldon, sales manager, was our friendly and welcoming hostess for our stay. We soon left for our first night of adventure. We traveled up the Sandia Peak tramway (2.7 miles) to the High Finance Restaurant and Tavern for some wonderful views of the sunset and a very tasty margarita served by our hostess, Christine Ezell (We were soon to learn that margaritas are the specialty of many places in Albuquerque!) Sandia Peak offers 25 miles of mountain trails (bike rentals available) and ski slopes. At the Hyatt Regency downtown we were served a delicious dinner in a private dining room courtesy of our host, Andrea Sandoval, sales manager. The hotel has a beautiful open foyer, is centrally located and very convenient to all cultural and historic attractions. We next went to the turquoise museum, which houses the largest private collection of turquoise, to learn about the mines and mineralogy. This is a family owned business with Joe Lowry and his children explaining to us on how to determine the true quality of the stones. Many in our group purchased jewelry that was guaranteed genuine turquoise. The turquoise museum is located on the fringe of Old Town, so we walked over to have a tour. Old Town was designed in a square to protect the townspeople during the Mexican/American war. Today it houses the San Felipe De Neri Church (founded in 1706), along with many specialty gift shops. There is a gazebo in the center and during the tree lighting ceremony that evening, a band was playing Christmas carols. We were on our own for a couple of hours to shop, shop, shop at many craft, art and clothing shops. At 2pm we walked to the Albuquerque Museum of Art and History, where we enjoyed a brief tour of some native exhibits. There was also an exhibit of French impressionists from Millet to Matisse. From there we walked to the LodeStar & Natural History Museum. We explored the natural history of New Mexico from the dinosaurs on forward. The museum is working directly with the Smithsonian in Washington and will soon be displaying the latest on space exploration. We walked to nearby Sheraton Old Town for dinner, hosted by Tina Sanchez, sales manager. As one can tell from the above description of our day, this hotel is conveniently located in Old Town, within walking distance of all the attractions. After dinner we strolled back to Old Town for the tree lighting ceremony. Candles in paper bags (luminaries) were everywhere lining the streets, walls, hotels, and private yards. An impressive sight to see! We next hopped on our tour bus to go down to the BioPark to see the River of Lights. The BioPark is a wonderful place for children of all ages. There are huge bugs, pumpkins, animals and two botanical gardens, one for desert plants and one for tropical plants. The lighting display only occurs at Christmas time and is a must see in Albuquerque! There were running tigers (done with changing lights), elephants, a huge spider and web, and trains running around mountain displays, all set in a park along the river. Watching the enjoyment on the children’s faces was pure joy. Fireworks lit up the skies and were enjoyed by all! 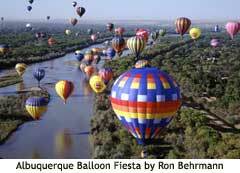 Up very early on Saturday for our hot air balloon ride, sponsored by Rainbow Ryders, official balloon rider operator at the annual (October) Albuquerque International Balloon Festival, when 300+ colorful balloons are competing for fun and prizes. Part of the fun of the balloon experience is helping to inflate and deflate the balloon. Having a major fear of heights did not deter me from soaring over Albuquerque and loving every minute of it! After the ride it is traditional to enjoy breakfast with champagne and mimosas to celebrate the safe landing. At 10 it was off to Santa Fe via the Turquoise Trail, for a walking tour and a little shopping. Native Indians line up in front of the stores selling their hand made crafts. Most tribes have their own unique items and designs, but the Navahos sell whatever is popular with the tourists. The late afternoon drive brought us back with a stop at the Hyatt Regency Tamaya Resort and Spa, located about mid-way between Santa Fe and Albuquerque. This is a beautiful and new all exclusive, full-service hotel with spa and golf course and many trails for riding and hiking. Dinner this evening was at the famous El Pinto’s in Albuquerque. The food and margaritas are highly recommended. They bottle and sell their salsa and chilies to Wal-Mart, and were generous enough to provide us with a bottle of each. Back at the hotel by 9 pm, I decided it was time to venture out on my own to sample the local entertainment in the form of the nearest casino. There are over 30 Native American casinos in New Mexico and more are being built. From my hotel I called the nearest casino. They sent over a van to pick me up and drove me to their establishment. I gambled, walked around and enjoyed the ambiance. When I was ready, I walked to the nearest security guard and requested a ride back to my hotel. The van arrived within ten minutes and I was safely driven “home”. Sunday we toured up into Acoma Sky City (located on top of a mesa), ancestral home of the Acoma Indians. They are one of the few tribes that allow visitors onto their tribal lands (excluding the casino areas), but by appointment only. Some Native guides led us over their mesa explaining their customs and traditions, while educating us about the architecture of the buildings. A final stop was made at the Indian Pueblo Cultural Center, where we enjoyed some Native dancing and an opportunity to buy Native American handicraft, before our complementary lunch. Last was the ride back to the hotel for checkout and the trip to the airport. All in all we enjoyed a busy and fun filled long weekend thanks to Shamaine, and the Albuquerque Convention and Visitor’s Bureau.